Each year keeps getting better. Columbus residents rallied this year in support of MTGives, donating nearly $92,000 last week for 18 area non-profits. The support came online and in person from approximately 300 donors. Sponsored locally by the Columbus Community Foundation, MTGives is part of a national day of giving that unites non-profits and heightens awareness for philanthropy. By the end of last week, Columbus’ generosity set a new record. Last Thursday, groups representing such varied organizations as Granite Peak Little League, the Museum of the Beartooths and Kruisin’ 4 Seniors – to mention just a few – gathered at Beartooth Ford for a donor lounge sponsored by Project Hope. 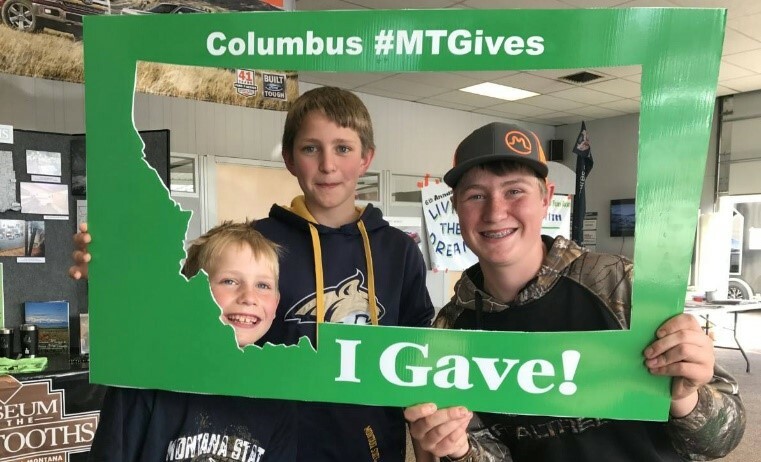 By day’s end, dollars donated to MTGives went to support a wide range of projects – from trails in Columbus, to scholarships for children to attend Camp Miminaugish, to weed control efforts along the Stillwater River, to mental health services in Stillwater County. The list goes on, but each non-profit offers its unique way to better the lives of Columbus residents. Friends and supporters donated online or stopped by the donor lounge with checks in hand to give toward the causes they care about most. To up the ante, more than $15,000 in matching funds was raised from Altana, Farmers Union, First Interstate Bank, Montanan Silversmiths, Sibanye Stillwater and Yellowstone Bank. These dollars will be distributed to the participating organizations, based proportionately on how much each raised. In addition, Montana Outlaw BBQ donated all of the proceeds from the barbeque they sold throughout the event. Planning for MTGives started early in the year for the Columbus Community Foundation, which now focusses on the day as one of its premier events. The foundation covers the marketing, promotion and even offered a fundraising workshop. In addition, the foundation generated thousands of dollars for the local match pool to incentivize the various organizations and to help donations go further, Hauge said. Halstead-Acharya is a board member of the Columbus Community Foundation.